What are those weird patterns on prototype cars? Living in southeast Michigan, you’ve certainly at some point seen an automobile wrapped in what appears to be a vinyl vorticism or cubism design pattern. What you’re seeing is likely a prototype of a new car from one of the Big Three out on the road, either being tested in real-world scenarios or being being driven to a testing location, such as General Motors’ proving grounds in Milford. Dazzle camouflage began during World War I and was even used in World War II U.S. and British military. Rather than hiding the subject, it was intended to mislead enemies about the size, course and speed of the vehicles. If the intended course is different from how the ship appears to travel, the Central or Axis soldiers could place themselves in disadvantageous positions or even fire on the wrong area, giving their location away. Modern automobile prototypes have the patterns printed on a strong, lightweight polyester adhered to the exterior of the vehicle. The patterns are typically white, black and gray, which hides and adds shadows, obscuring the design elements of the vehicle. 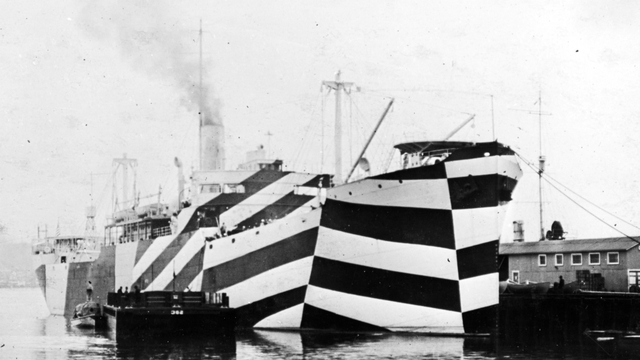 World War I cargo ship SS West Mahomet painted with dazzle camouflage, Nov. 1918. The contrasting patterns also have the added benefit today to both make it difficult for smart phone cameras to focus as well as throw off infa-red cameras. Recent studies show swirls hide design changes better than lines, as they are also easier to align when changes do occur. Dazzle camouflage has been such an important part of hiding the changes in design when testing that car companies even employ camouflage engineers to custom design patterns to optimally hide the vehicle in tandem with the car. It also looks cool and brings attention to the brand. The North American International Auto Show (NAIAS) today announced Gov. Rick Snyder has officially proclaimed Jan. 14 – 21, 2018, as AutoMobili-D Week in the state of Michigan. Now in its second year at NAIAS, AutoMobili-D is a global exposition of the automotive ecosystem – from startups and venture capital firms to suppliers, automakers, universities and government organizations. AutoMobili-D will kick off on Sunday, Jan.14 with a keynote address from U.S. Secretary of Transportation Secretary Elaine L. Chao. A full week of mobility immersion will follow with a showcase of 57 startups from around the world, over 160 exhibitors and a powerful lineup of industry leaders and visionaries taking the stage. “We’re honored by Gov. Snyder’s proclamation recognizing this amazing exposition of innovative companies all coming to Detroit to learn what the future of the automotive industry will hold,” said 2018 NAIAS Chairman Ryan LaFontaine. The first Future Automotive Career Exposition (FACE), held in partnership with NAIAS and the Michigan Economic Development Corporation, will take place at AutoMobili-D on Jan. 20 – 21, connecting people interested in working in the industry with AutoMobili-D companies. Now in its 30th year as an international event, the NAIAS is among the most prestigious auto shows in the world, providing unparalleled access to the automotive products, technologies, people and ideas that matter most – up close and in one place. Administered by executive director Rod Alberts, the NAIAS is one of the largest media events in North America, and the only auto show in the United States to earn an annual distinguished sanction of the Organisation Internationale des Constructeurs d’Automobiles, the Paris-based alliance of automotive trade associations and manufacturers from around the world. For more information, visit naias.com. What if you’re not necessarily looking for a new car but maybe you’d like a new job? Sure, we’re talking about job openings in the highly cyclical auto industry, even though we’re increasingly captivated by the race to build highly technical self-driving cars and trucks. Yet experts say we’re likely to see all sorts of creative approaches for filling many jobs in 2018. We shouldn’t be surprised to spot employers doing all they can to hire the right fit for the job in 2018 when we’re looking at ultra-low unemployment levels. The U.S. jobless rate was 4.1% in December — and the expectation is that the rate will drop further into 2018. “This unemployment rate is going south,” said Mark Zandi, chief economist at Moody’s Analytics. It’s possible, Zandi said, that the jobless rate will fall into the mid-3% range this year. He’s predicting an extraordinarily tight labor market, similar to times back in the 1950s. This year, it’s likely that automakers could need to adjust production with shifts in consumer demand and deal with anticipated lower sales volumes. “Auto manufacturing jobs will be fluid in the next few years,” said Michelle Krebs, senior analyst at Autotrader. “Software engineers remain in high demand, particularly those with experience in driver-assist technologies,” said Charlie Chesborough, senior economist at Cox Automotive, which includes the Kelley Blue Book and AutoTrader sites. Fiat Chrysler, for example, noted that skilled trades positions are harder to fill because of the unique qualifications. Skills needed include electrical, mechanical, tool maker, die maker, pipefitter, machine repair and energy center operator. See FCA job openings at http://www.fcagroupcareers.com. Candidates can search for positions by state at manufacturing facilities in Michigan, Illinois, Indiana and Ohio. “The event isn’t designed to be a typical job fair,” said Dave Murray, communications director at the Michigan Department of Talent and Economic Development. Michigan employers looking to fill high-skill jobs in many industries also are listed at http://www.mitalent.org. The site includes information about career fairs and hiring events. Many companies that have a presence at AutoMobili-D have jobs listed on their web sites. Many jobs listed will be outside Michigan. Detroit is where future mobility innovations meet the pavement. 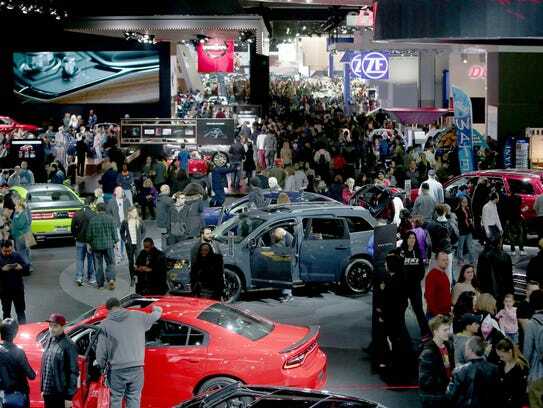 With the largest concentration of the world’s top automotive and technology executives, designers, engineers and thought leaders, the North American International Auto Show serves as the global stage for companies to debut brand defining vehicles and industry-shaping announcements. Automobili-D is a dedicated exposition focused on the rapidly evolving global automotive and mobility landscape. Spearheaded by NAIAS, AutoMobili-D will run in conjunction with the 2017 auto show and will feature more than 100 companies, including automakers, tier one suppliers and tech startups. AutoMobili-D will kick-off on Sunday, January 8, 2017, the day prior to the start of NAIAS Press Days (Jan. 9-10), and will run through NAIAS Industry Days (Jan. 11-12). A very prominent industry thought leader will keynote Sunday’s opening ceremony following an open house that will allow guests to network with peers and participating companies as well as interact with the technologies and vehicles on display. NAIAS will dedicate specific press conference slots for participating AutoMobili-D companies on the afternoons of both Press Days. Join exhibiting automakers and tier one suppliers along with journalists on a global stage for two full days of reveals, debuts and memorable moments. Featuring over 750 vehicles and countless interactive displays, NAIAS is North America’s largest and most prestigious automotive showcase. Connect and share insights with over 35,000 automotive professionals and analysts representing over 2,000 companies from around the world. This unique networking and professional development opportunity brings together the key individuals responsible for the leading-edge products, technologies and services on display at NAIAS. Charity Preview is your opportunity to be part of one of the most exclusive, high-profile charitable fundraising events in the nation. Proceeds directly benefit a wide range of children’s charities that are making a positive impact in southeastern Michigan. Since 1976, Charity Preview has raised more than $106 million, with over $41 million raised in the last 10 years alone. Experience the next generation of transportation at the North American International Auto Show 2016. See more than 750 vehicles on display representing the most innovative designs in the world, and experience North America’s largest and most prestigious automotive showcase. PLEASE NOTE: Seniors’ and childrens’ tickets must be purchased at the door and are only valid the day of purchase. – Print voucher to redeem tickets at the eTicket window, located outside the Hall C entrance. – The Ticket window is open 8:00 a.m. to 9:00 p.m., January 16 – 23 and 8:00 a.m. to 6:00 p.m., January 24. – Each order must be picked up in its entirety. – A photo ID is required to pick up tickets. – Discounted rate of $9 per ticket is available for groups of 30 or more. – Pickup is located at the window outside the Hall C entrance. – American Express, Visa, Mastercard, and business checks accepted. Personal checks and cash not accepted. – A photo ID is required to pick-up tickets. – Children 6 and under are free when accompanied by a parent or guardian and do not require a ticket. – There is no group discount for senior tickets. – Tickets may be purchased the day of the show at ticket booths located in the Cobo Center concourse (cash only). – Ticket kiosks located in Cobo Center in the concourse (credit card only). Cobo Center provides motorized scooters on a first-come, first-served basis for people with disabilities. Each scooter is $35.00 per 4-hour period. Valid driver’s license and signed rental agreement required with each reservation. Visa, MasterCard, American Express, Discover and cash payments accepted. Visit Visit http://naias.com/ for more details about the upcoming show! The new TITAN-XD, the first of the new generation of Nissan TITAN models, creates a new segment of the American market. It offers the effortless towing and hauling of the larger, more expensive heavy-duty trucks – yet has the fuel-efficiency and affordability of half-ton pickups. It is projected to go on sale at Nissan dealers nationwide in late 2015. Powered by a new Cummins 5.0L V8 Turbo Diesel rated at 310 horsepower and hefty 555 lb-ft of torque, the 2016 TITAN-XD will offer an available maximum towing capacity of more than 12,000 pounds (when properly equipped), along with available cutting-edge towing features such as an integrated gooseneck hitch engineered into the frame. Additional available TITAN-XD utility features and convenience aids include RearView Monitor with Trailer Guides, Around View® Monitor (AVM) with Moving Object Detection (MOD) and a Trailer Light Check system that allows one-person hook-up operation – including checking turn signals, brake lights and running/clearance lights from outside the vehicle. Also available are Blind Spot Warning (BSW) and a Front and Rear Sonar System. The wide range of available interior features includes front and rear NASA-inspired Zero Gravity seats and a large center console designed to serve as a mobile workstation. More details on the full Nissan TITAN lineup will be announced at a later date. The all-new TITAN, like the first-generation Titan, was developed with core Nissan planning, design, engineering and manufacturing teams contributing from Tennessee, California, Michigan, Arizona and Mississippi. The all-new TITAN also underscores Nissan’s commitment to localized production. Nissan has invested more than $5 billion in the United States in the past five years and has moved manufacturing for several models from overseas to its North American plants. The new TITAN-XD Crew Cab is the first of three cab configurations, two frame sizes, three powertrain offerings and five grade levels to be available later in the Nissan TITAN lineup. More information on the full lineup will be available at a later date. For photography and additional information about the 2016 Nissan TITAN-XD, along with the complete lineup of 2015 Nissan vehicles, please visit NissanNews.com. NAIAS 2014 featured 50 vehicle debuts with the majority being worldwide. Over 5,000 journalists attended from 60 countries. Over 30 percent of the journalists were international, thus helping to spread automotive news made at NAIAS 2014 to the world. NAIAS is uniquely positioned to be four shows in one – a media preview, an industry preview, a charity preview and a public show with a 9-day run. The North American International Auto Show 2015 is where the global automotive community comes together to catch up on the latest news and events. Join your peers from around the world at the industry’s most substantive annual event. In addition to some of the automotive world’s most eagerly anticipated new vehicle premieres, you’ll gain unprecedented access to more of the industry’s top leaders and thinkers than anywhere else in the hemisphere. Connect with automotive professionals representing almost 2,000 companies and share insights with over 28,000 of your peers. Make new connections. Forge new alliances. Be inspired to lead and succeed. This unique networking opportunity brings together the latest automotive products and services with the key minds behind them all under one roof. Enjoy the first views of the spectacular North American International Auto Show 2015. Charity Preview is your opportunity to be a part of one of the most exclusive, high profile events in the nation. Proceeds directly benefit a wide range of children’s charities. Funds raised will support services for children of all ages from birth to 18. Since 1976, the Charity Preview has raised more than $91 million for southeastern Michigan children’s charities – over $47 million of which was raised in the last 10 years alone. Experience the next generation of transportation at the North American International Auto Show 2015. See more than 500 vehicles on display, representing the most innovative designs in the world and experience North America’s largest and most prestigious automotive showcase. When Nissan introduced the production version of the third-generation Murano at the New York auto show this year, the crowds were somewhere between surprised and shocked that the undulatory exterior and wacky roof pillars of the concept hadn’t been dulled down in production trim the way most concepts are. The wavy forms down the side and the sloping roof were still there, no doubt terrifying the metal stamping machines at the beast’s Canton, Miss. production plant. But that exterior contributes as much to the vehicle’s significant improvements as anything else. When it arrives in showrooms in December the Murano will be 130 pounds lighter, 20 percent more fuel efficient and its cd will have dropped by .06 to 0.31. All of those improvements are interrelated. Nissan said it was able to lower the curb weight through design efficiencies and with the selective use of high-strength steel, particularly in areas beefed up for better side-impact protection. While no 2015 specifictions were released, if you knock off 130 pounds from the current Murano’s heft you get curb weights for the 2015 model that will range from 3693 to 4025 pounds. That’s less than V6-powered competitors like the Ford Edge and Toyota Venza but a little more than four-cylinder competitors like the Hyundai Santa Fe and Ford Escape. Turns out that sculpted exterior is functional, too. While the basic shape and proportions haven’t changed compared to the Resonance concept that debuted at the 2013 Detroit show, the surface of it has, up to an inch and a half here and there as needed for better laminar airflow. The new head- and taillights, as extreme as the rest of the shapes, help reduce drag, as well. The production model spent three times the number of hours in the wind tunnel compared to the 2014 Murano. That’s what it takes to get from 0.37 to 0.31 cd. The standard Xtronic CVT transmission – the only one that will be offered – is more efficient, with reduced internal friction, Nissan says. As with the four-cylinder Altima and Rogue, the 2015 Murano CVT will get D-Step Shift logic to provide the illusion that it is a traditional automatic transmission. Faking shifts appears to reassure customers that there is nothing wrong with their trannies, and gives enthusiast drivers something to do going around corners. The D-Step shift algorithms come next to the Versa, Versa Note, Sentra, Altima V6, Pathfinder and Quest. It seems like there’s no going away from CVTs at Nissan. All the above increases the 2015 Murano’s fuel economy from 20 EPA combined in the current vehicle to an estimated 24 in the coming ride. That will be with virtually the same 260-hp, 240-lb-ft 3.5-liter V6 engine as before. That front- or all wheel-drive powertrain will provide 0-60 acceleration “in the sixes,” according to Nissan, though specific times have not been released. “This is for the older empty nester couple and their friends,” explained senior product planning manager Scott Pak. The Rogue is for young couples with one kid, the Pathfinder’s for families with two children, and when the kids finally leave the parents get a Murano. The lounge aspect of that interior will be centered on what Nissan calls its “zero-gravity” seats. These feature three layers of urethane, grippy side bolsters and three (as opposed to the normal two) points of contact and support for your kiester. The front seats can be ordered as climate controlled meaning heating and cooling is available. What used to be known as the instrument cluster but which is now known as the “drive assist display” is a seven-inch reconfigurable full-color screen. Over on the center console is an eight-inch capacity touch NAV display that helps reduce the number of so-called hard buttons from 25 to 10. It includes the popular pinch and swipe gestures that the kids love so much on their phones. Behind the second row of seats there is 7.8 more cubic feet of cargo space, a huge leap in capacity, especially considering that the new Murano is only 2.5 inches longer than the current one. So that’s what we learned after we spent a day at Nissan’s Arizona proving grounds with a production prototype. Okay, we learned more than that but we can’t tell you. Driving impressions are under embargo till sometime around December. So despite having negotiated the high-speed oval, various rough-road surfaces and the really fun road course with whoop-dee-doos, expansion joints, frost heaves and manhole covers scattered at all the apexes, we can’t tell you whether the coming Murano crossover is really fun to drive or whether it blows. Sorry. Look for more info in a few months. 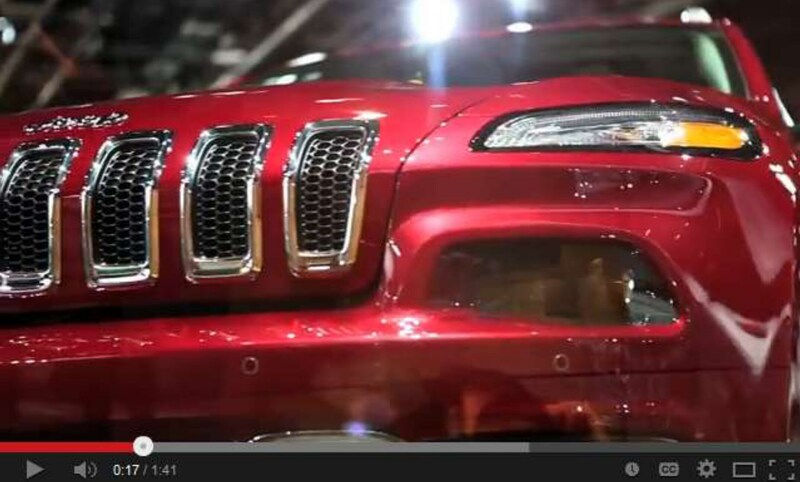 You may remember when the 2014 Jeep® Cherokee made its debut last year at the 2013 New York International Auto Show. This year at the North American International Auto Show in Detroit, we wanted to bring you an up close and personal look at our newest vehicle. While we were there, we talked with Ron Frank, Jeep brand product specialist. He took us through some of the highlights of the vehicle, which you can see in the video below. Two Jeep brand advocates, Chase Carver and Daniel Luenzmann, also came to check out the vehicle for themselves. Carver agreed that the 2014 Cherokee stood out to him as well.